Peder Balke (1804–1887), Stetind in Fog (1864), oil on canvas, 71 x 58 cm, Nasjonalgalleriet, Oslo, Norway. Wikimedia Commons. The North Cape, at the far north of Norway, is now a popular tourist spot. You can get there on one of the superb summer cruises which make their way up the coast of Norway, or drive straight up the E69 highway. It’s actually not the most northerly point on the mainland of Europe, as it is on an inshore island, and the adjacent cape of Knivskjellodden stretches slightly further north but has a rather less memorable name. Nevertheless, it is a profoundly evocative place. 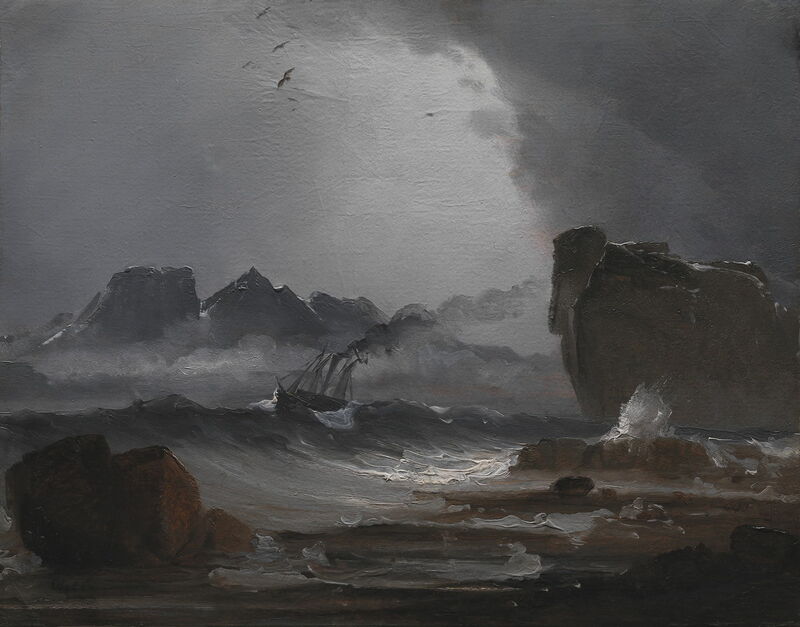 When the Norwegian landscape painter Peder Balke (1804–1887) painted it, in the middle of the nineteenth century, few people had ever seen it, and it was more hostile and impenetrable than Cape Horn, although it had been ‘discovered’ in 1553. Balke wasn’t born in the far north, and originally had the last name of Andersen. In the 1820s he lived on the Balke farm, where local farmers supported his education in return for his decorating their farmhouses. He changed his name in about 1825, and two years later was working as an apprentice to the painter Heinrich August Grosch. Between 1829-1833 he trained at the art academy in Stockholm, Sweden, and was later a pupil of the father of Norwegian landscape painting, Johan Christian Dahl. 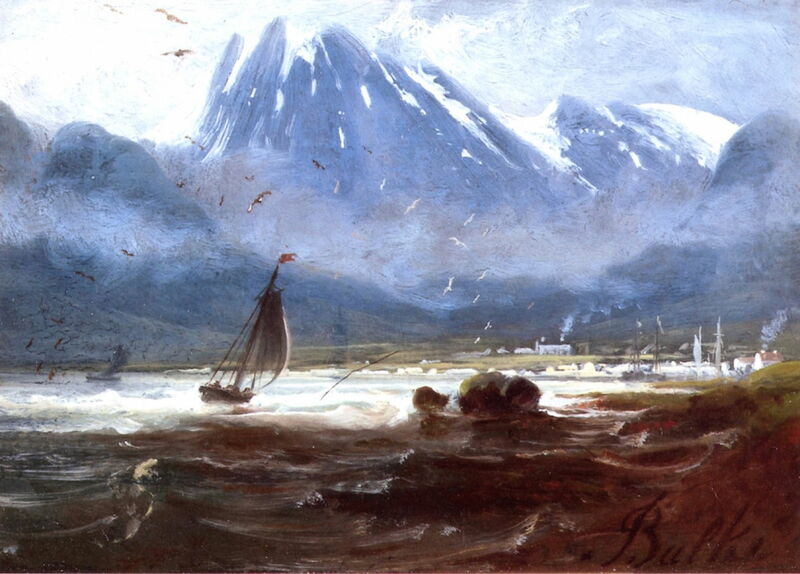 When still a student in the summer of 1830, Balke walked through the mountains in Telemark to Bergen, then back to Hallingdal – a feat in itself, only he also made sketches which he later turned into paintings. 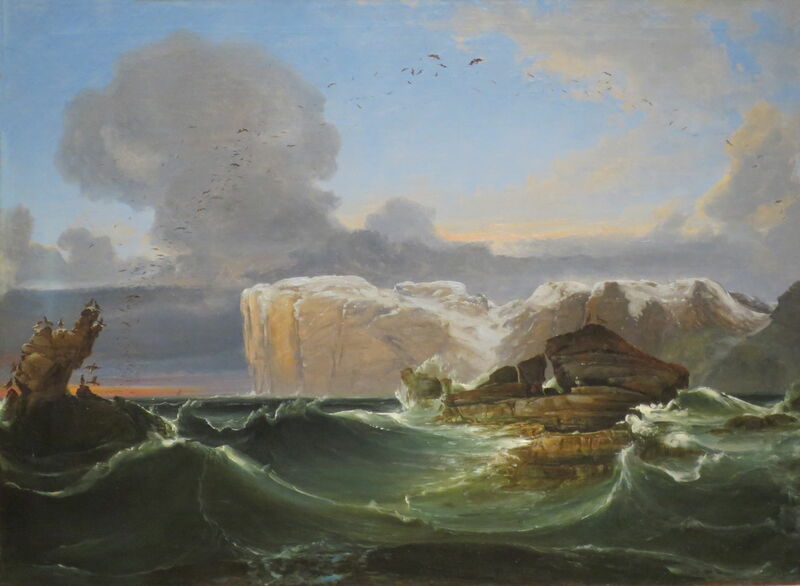 In 1832, he toured Finnmark in much the same way, and it was this trip to the far north which inspired him to paint the remote coast of northern Norway, including North Cape itself. Peder Balke (1804–1887), Mountain Range Trolltindene (c 1840), oil on canvas, 30.8 x 41.9 cm, Nordnorsk Kunstmuseum, Tromsø, Norway. Image by Illustratedjc, via Wikimedia Commons. 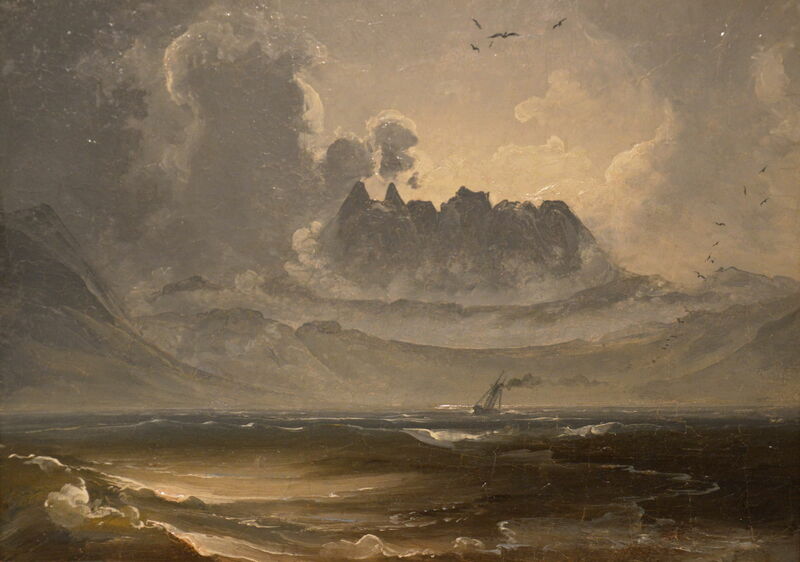 One of his earliest surviving paintings of the coast is the romantic and dramatic Mountain Range Trolltindene from about 1840. Its carefully framed clear patch in the clouds reveals this part of a mountain chain rising to over 2000 metres (over 6,500 feet), at the western edge of the great Rondane National Park in central Norway. Peder Balke (1804–1887), The Harbor at Skjervøy (c 1844-46), oil on paper on cardboard, 12 x 17.5 cm, Private collection. The Athenaeum. The Harbor at Skjervøy (c 1844-46) shows this small fishing port in Troms, in the far north of Norway. The weather is clearly blustery, and Balke’s sky full of wheeling seabirds. Peder Balke (1804–1887), Ship in Breaking Waves (c 1840-49), oil on canvas, 64.5 x 91 cm, Bergen Kunstmuseum (KODE, the Art Museums of Bergen), Bergen, Norway. The Athenaeum. From quite early on in his career, Balke developed a liking for nocturnes, in which the moonlight could enhance the dramatic effect. Ship in Breaking Waves (c 1840-49) shows very skilful use of limited light and cloud, and the great hazards which sailing vessels were exposed to along remote and rocky coasts. 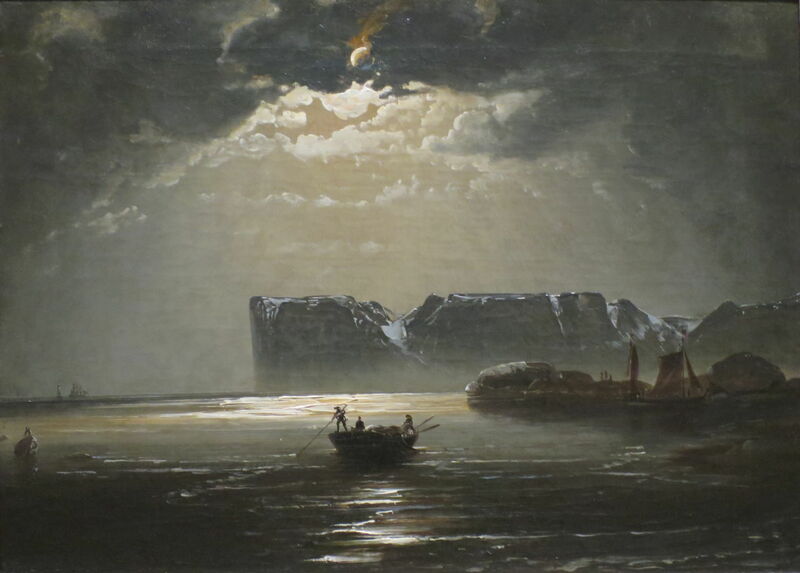 Peder Balke (1804–1887), North Cape (1845), oil on canvas, 95 x 132 cm, Nordnorsk Kunstmuseum, Tromsø, Norway. Wikimedia Commons. 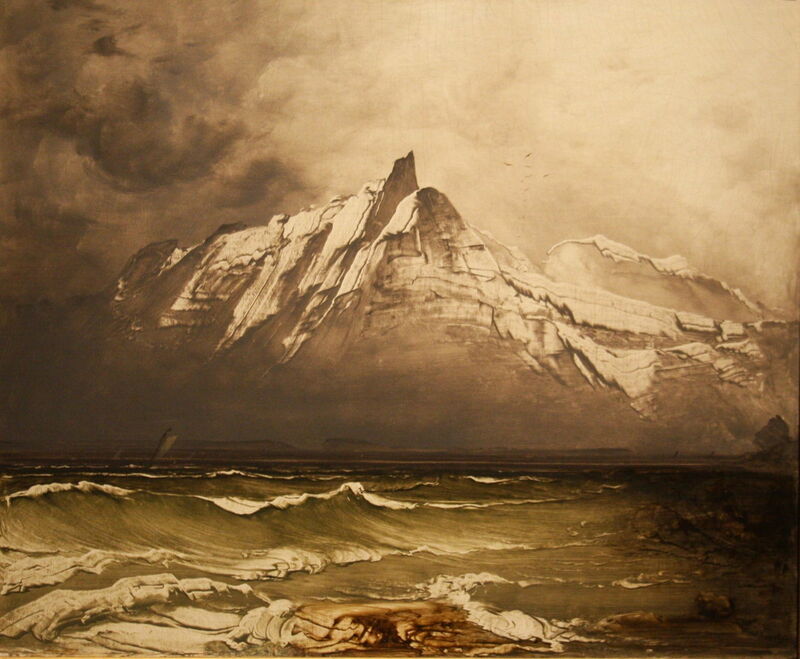 During the 1840s, Balke started to paint a series of works showing the towering sea cliffs of North Cape. This version from 1845 seems to have been the basis for several later paintings, in which the motif became more elaborated. Peder Balke (1804–1887), North Cape (c 1840-59), oil on canvas, dimensions not known, Private collection. Wikimedia Commons. 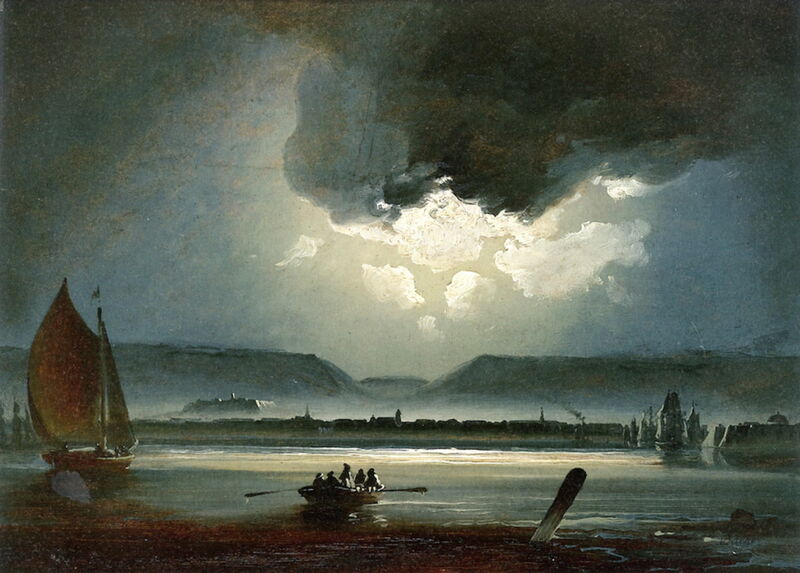 He painted several similar nocturnes of North Cape, this from some time in the 1840s or 1850s. These show calmer conditions, which contrast with the rectangular bulk of the cliffs, and a small boat being navigated across the reflection of the moon. During this period, he made similar versions for the French crown, which are now in storage at the Louvre. Peder Balke (1804–1887), The Seven Sisters Mountain Range (c 1845-50), oil on panel, 25 x 31 cm, Private collection. The Athenaeum. 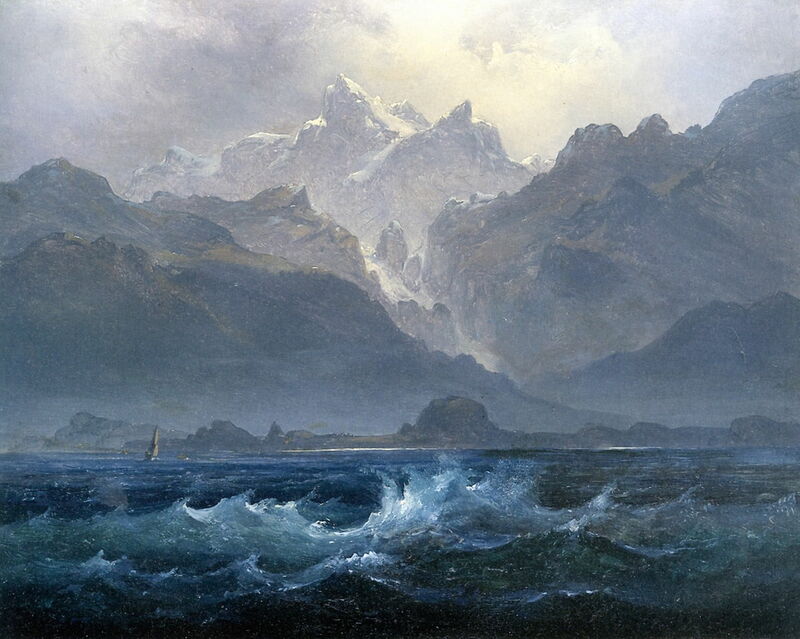 Balke’s painting of The Seven Sisters Mountain Range (c 1845-50) shows this spectacular chain of seven mountains on the northern section of the coast of Norway. They rise from sea level to almost 2000 metres (6,500 feet) in a tangled mass of rock spires and icefalls. Peder Balke (1804–1887), Rough Sea with a Steamship Near the Norwegian Coast (c 1847-50), oil on paper, 33.5 × 42.5 cm, Statens Museum for Kunst (Den Kongelige Malerisamling), Copenhagen, Denmark. Wikimedia Commons. This was the era of the first mechanically-propelled ships, which Balke shows in his Rough Sea with a Steamship Near the Norwegian Coast (c 1847-50). The first steamship crossed the English Channel in 1822, and in 1839 the first steamship driven by a screw propellor was commissioned. 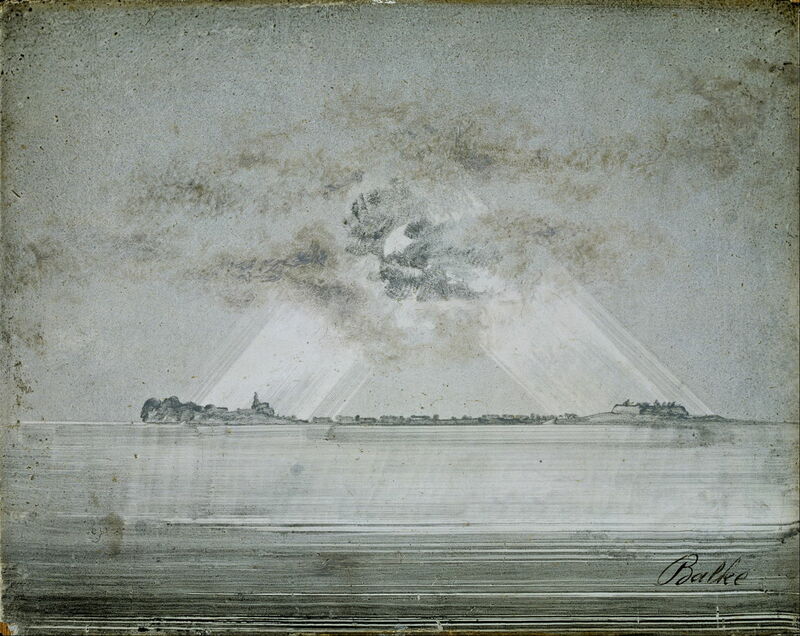 Balke’s painting must have been among the first to show such a ship under way in remote parts. Peder Balke (1804–1887), Moonlit View of Trondheim (c 1840-49), oil on canvas, 44 x 63 cm, Private collection. The Athenaeum. 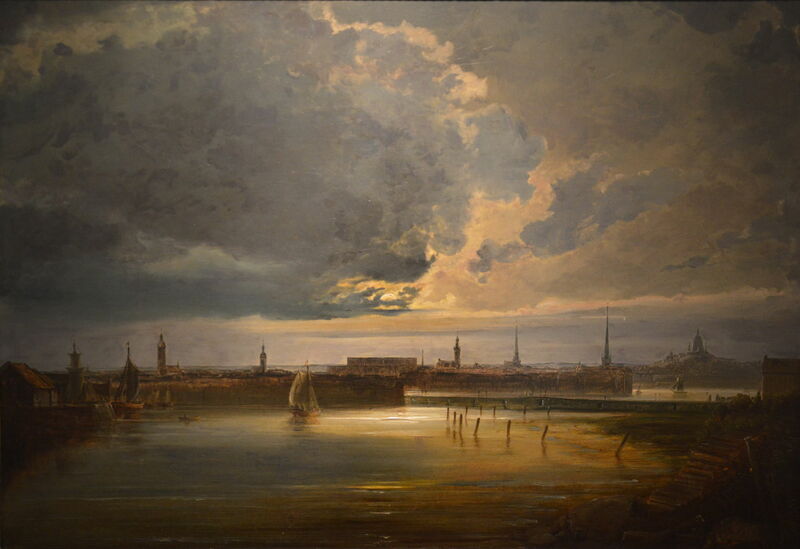 Around 1850, Balke painted nocturnes of some of the major Nordic cities. Moonlit View of Trondheim (c 1840-49) shows this city on the coast of Norway, which forms the gateway to the north. Peder Balke (1804–1887), Moonlit View of Stockholm (1851), oil on panel, 67.3 x 100.3 cm, Nordnorsk Kunstmuseum, Tromsø, Norway. Image by Illustratedjc, via Wikimedia Commons. That work was matched with this superb Moonlit View of Stockholm (1851), the capital of Sweden, which now stretches across fourteen islands at the point where Lake Mälaren empties into the Baltic Sea. Peder Balke (1804–1887), Lighthouse on the Norwegian Coast (1855), oil on canvas on plate, 58.5 x 70.5 cm, Nasjonalgalleriet, Oslo, Norway. Wikimedia Commons. Peder Balke’s Lighthouse on the Norwegian Coast (1855) shows one of the chain of remote and rugged lighthouses which mark the treacherous hazards of the Norwegian coast. Peder Balke (1804–1887), From North Cape (c 1860), oil on paper on cardboard, 35.2 x 25.5 cm, Nordnorsk Kunstmuseum, Tromsø, Norway. Wikimedia Commons. 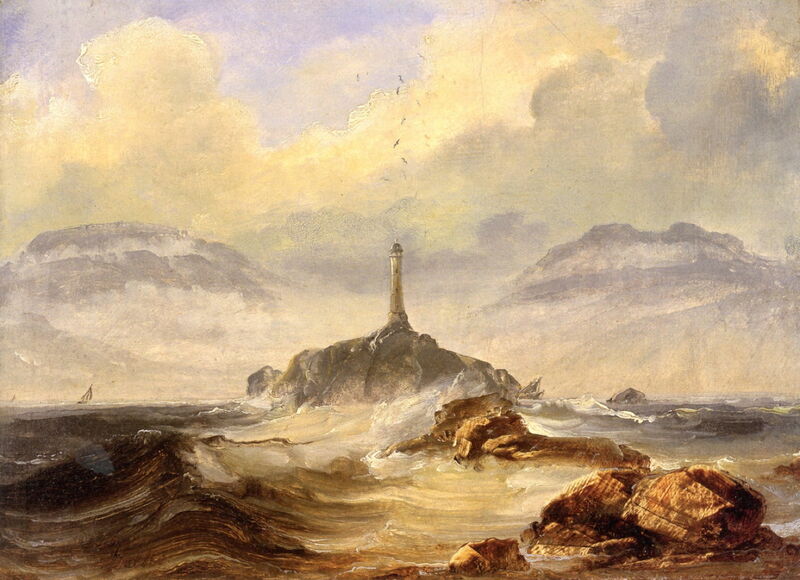 Balke returned to his earlier motif in From North Cape, which was painted in about 1860. 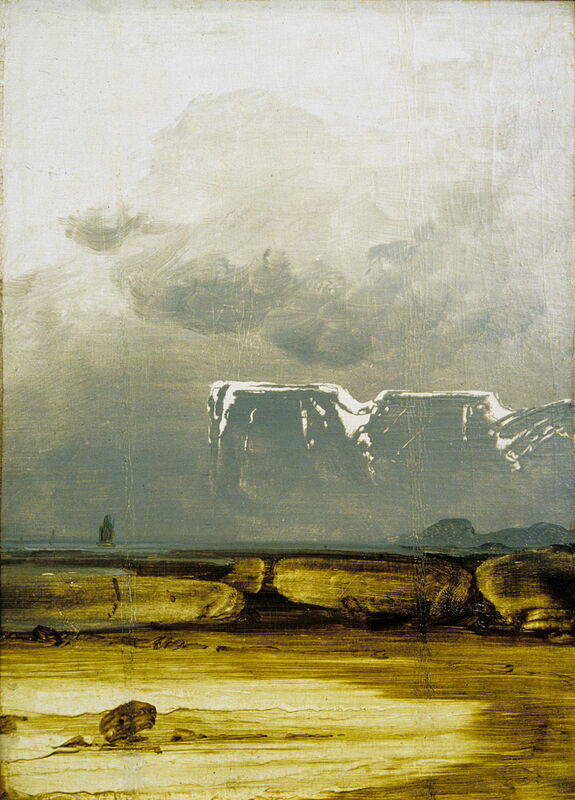 Peder Balke (1804–1887), The Tempest (c 1862), oil on wood panel, 10.3 x 12.2 cm, The National Gallery (Presented by Danny and Gry Katz, 2010), London. Image courtesy of and © The National Gallery, London. 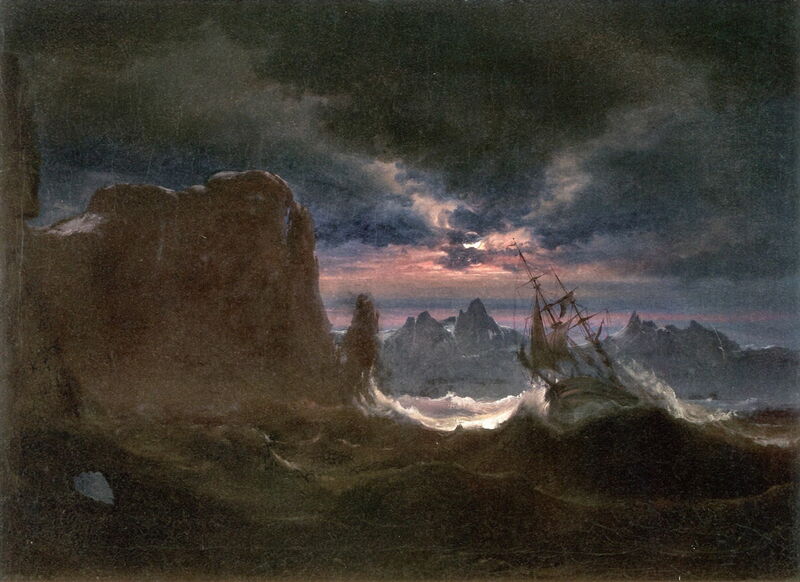 His small panel sketch of The Tempest was painted in about 1862, and shows two ships, one clearly a steamship, heeling hard to starboard in a storm. Peder Balke (1804–1887), Coastal Landscape with Wreck (1860-69), oil on canvas, 25 x 18 cm, Nasjonalgalleriet, Oslo, Norway. Wikimedia Commons. 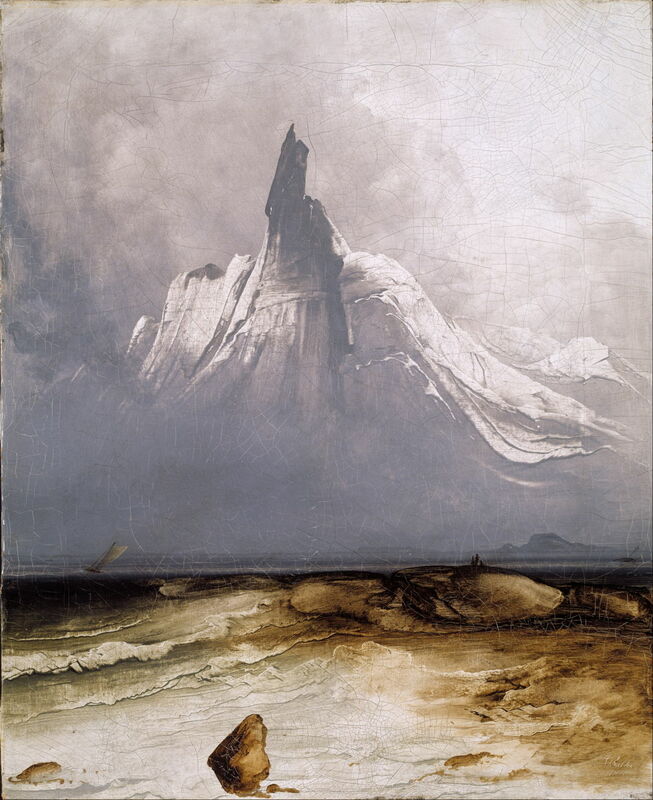 Coastal Landscape with Wreck (1860-69) shows his favourite mountain Stetind in the far north, with its distinctive form, and its stepped peak which is often compared to an anvil. It has been voted as the National Mountain of Norway, but its shape appeared to terrify those who unsuccessfully attempted its first ascent in 1910. Peder Balke (1804–1887), Lighthouse on the Coast (c 1860-69), oil on cardboard, 26 x 36 cm, Nordnorsk Kunstmuseum, Tromsø, Norway. The Athenaeum. 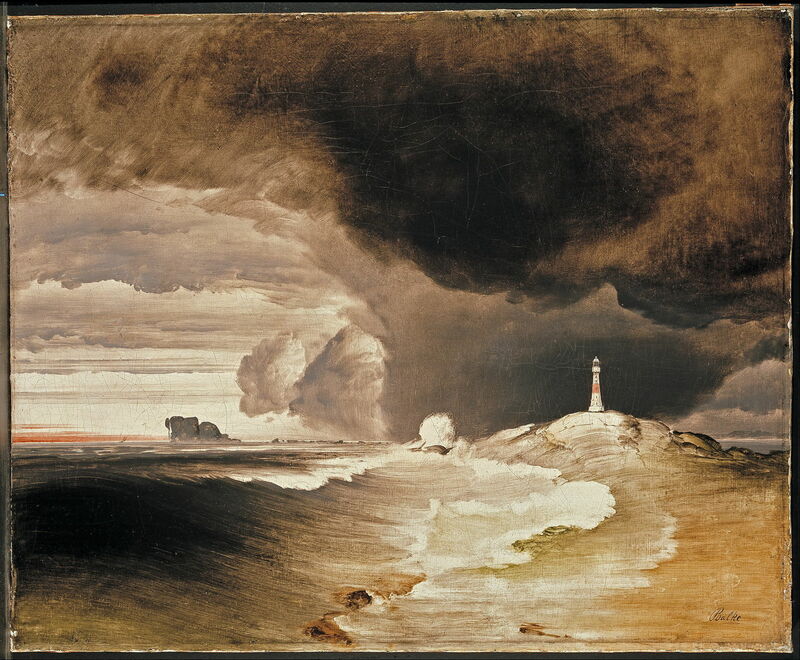 In his later paintings, Balke started to apply his oil paint in distinctive striated strokes, as seen in the sea in his Lighthouse on the Coast from some time in the 1860s. Peder Balke (1804–1887), From Nordland (c 1860-69), oil on canvas, 61 x 72 cm, Nationalmuseum, Stockholm, Norway. Wikimedia Commons. From Nordland, painted during the same decade, shows the rugged section of coast stretching up to the Lofoten Islands in the north of Norway. 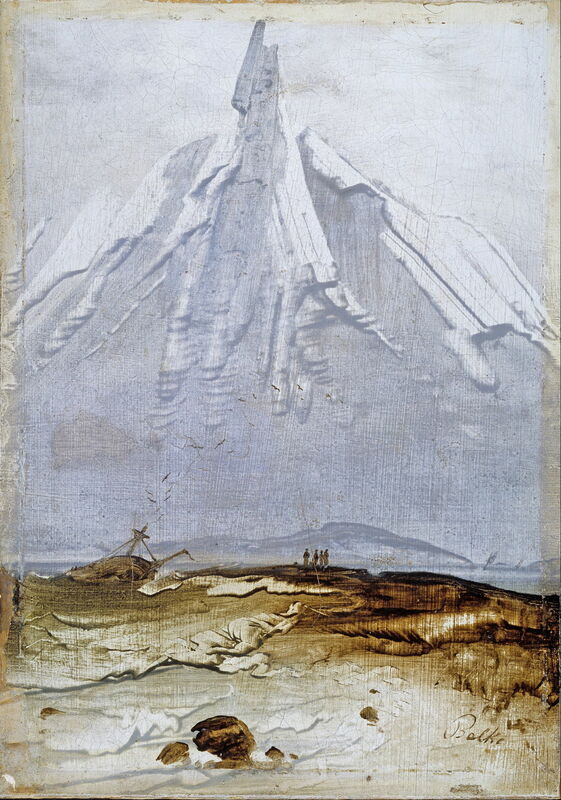 Stetind in Fog (1864) revisits Balke’s favourite mountain, in a similar view to his earlier Coastal Landscape with Wreck. During the 1860s, it became clear to Balke that trying to make his living as a painter was not going to work out. He increasingly made small paintings on ephemeral supports for his own pleasure, rather than that of others. He took the opportunity to propose some ideas about social reform, and founded his own idealistic colony on the outskirts of Oslo. The last paintings of his are some of his most remarkable. Freed from the constraints of painting for sale, his style changed radically. Peder Balke (1804–1887), Northern Lights over Coastal Landscape (1870), oil on paper on cardboard, 10.5 x 12 cm, Nasjonalgalleriet, Oslo, Norway. Wikimedia Commons. 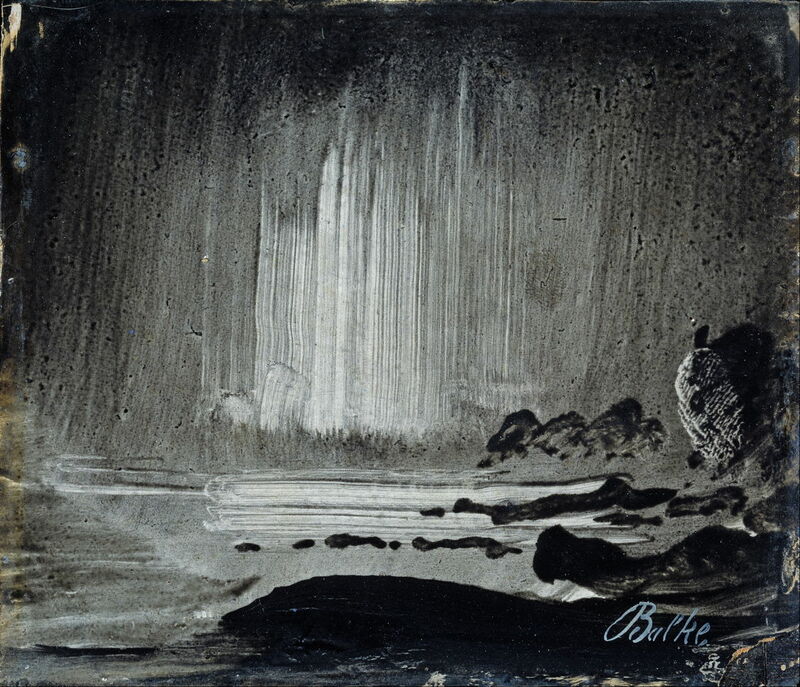 He made several small views of the Northern Lights over Coastal Landscape, this from 1870, in which the aurora is modelled from strokes of paint. Peder Balke (1804–1887), Vardøhus Fortress (1870), oil on panel, 18 x 23 cm, Nasjonalgalleriet, Oslo, Norway. Wikimedia Commons. Vardøhus Fortress (1870) is another very distinctive painting, which shows the most northern star fort in the world. This is in Finnmark, almost at the Norwegian border, well to the east of North Cape, and derives from a fort which was first built in 1306. After Balke’s death in 1887, his art became completely forgotten. His paintings in the great Scandinavian collections were seldom seen. It took until the twenty-first century for these to be ‘rediscovered’, and in 2014-15, over fifty of his paintings went on show at the National Gallery in London. His extraordinary depictions of the mountainous and remote coast of Norway have not been forgotten after all. The Northern Lights Route, University of Tromsø. 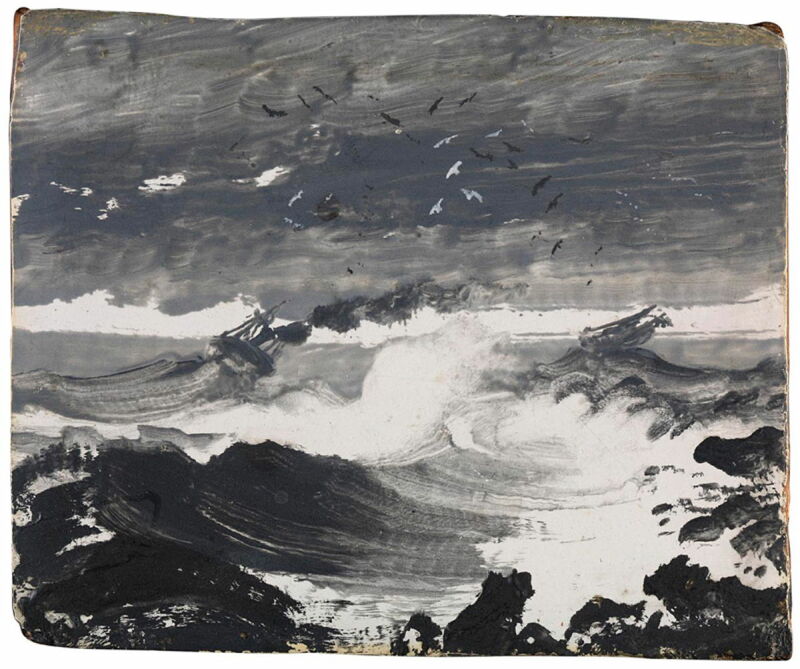 Bell, K (2015) Paintings by Peder Balke, National Gallery Company. ISBN 978 1 857 09582 1. Posted in General, Life, Painting and tagged Balke, coast, Dahl, landscape, Norway, painting. Bookmark the permalink.